One of the most recent phenomenons on the internet is the use of VoIP (Voice over IP) as a phone line. You know, it's when you have the phone TV and internet all in one package! People report different experiences using VoIP. Some say it slows down the internet when browsing, while others say that the phone line "breaks up" when in the middle of conversations, similar to a mobile phone in a poor signal area. The most commonly pondered question about Voice over Internet Protocol (VoIP) is regarding its usefulness in business as a phone line. Basically, is it any good for business communications? Judging by recent trends VoIP wil eventually become mainstream in the business telecommunications. According to a study published on the TechTarget website, in 2005 36% of large, 23% of midsized and 14% of North American companies were using VoIP as part of their communications strategy. They state that from 2005 to 2010, the number of companies using VoIP will have tripled. The benefits of VoIP are claimed to be that it is rich in features and is low cost compared to traditional telephony networks. 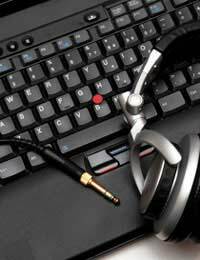 It is claimed that the audio quality is comparable to traditional networks. This may be perfectly feasible, but it may depend on the type of infrastructure supporting VoIP in the first place. Some companies use VoIP for their main business phone. It also depends on the kind of network you are running. A home network of up to 4 megabyte download speed should be fine unless other members of the household are utilising a great deal of the bandwidth, as can be the case with some online games. Is Sound Quality an Issue? Sometime VoIP works better on incoming calls than it does when making outgoing calls, or vice versa. It is not always reliable, but it is improving year on year. It is possible for the home user to specify how much of the bandwidth to use for VOIP so the sound quality can be improved or reduced if you wish to have more available bandwidth for surfing or for an internet intensive activity such as watching online videos. Although the evidence here seems pretty damning, the use of VoIP in a larger business setting cannot be ruled out. The reason is that most business's of a reasonable size, say 100+ employees have dedicated leased lines to the Internet offering much higher transmission speeds than the typical home user can muster with a router and home based internet connection. It may be that having a dedicated line for "VoIP only" calls could also help to solve the problem of poor quality phone calls. Because the evidence implies the number of companies using VoIP is increasing, the overall audio quality, features and low cost must be winning the day. The number of features for business using VoIP is substantially more useful to business than tradional phone lines using analogue technology. For instance, voice calls can be stoadired and sent by email to the recipient to be picked up when the user arrives home. Call forwarding and concurrent conversations and group phone telephony is much easier with VoIP technology. Overall, traditional telephony is still the preferred choice in business, but when the quality problems are ironed out the features and low cost will be too attractive for both business and home user to ignore.